Ann M. Martin is the bestselling author of the momentous series The Baby-sitters Club, as well as the Main Street series. 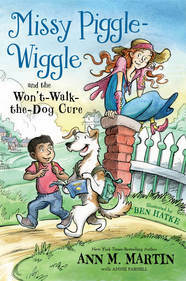 Her other acclaimed novels include Ten Rules for Living with My Sister, Ten Good and Bad Things About My Life, Everything for a Dog, Missy Piggle-Wiggle and the Whatever Cure, A Dog’s Life, Belle Teal, Here Today, and the Newbery Honor Book A Corner of the Universe. Ann M. Martin grew up in Princeton, New Jersey, and always enjoyed writing even before she was old enough to write. She would dictate stories to her mother to write them down for her. After graduating from Smith College, she became a teacher, and then an editor of children’s books before becoming a full-time writer. With 176 million copies sold to date, The Baby-sitters Club made her a household name. By the time the series ended in 2000, there were over 176,000,000 books in print from the original Baby-sitters Club and spinoff series, The Baby-sitter’s Little Sister. 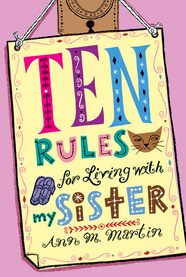 In addition to The Baby-sitters Club, Ann wrote the acclaimed novels-in-letters, P.S. Longer Letter Later and Snail Mail No More, with author Paula Danziger. She also co-wrote The Doll People books with Laura Godwin, illustrated by Brian Selznick. Her novel A Dog’s Life: The Autobiography of a Stray was a winner of the ASPCA Henry Bergh Children’s Book Award. Ann divides her time between New York City and upstate New York. She currently spends most of her time in her home in the Hudson Valley where she likes to write, go on long walks with her dog Sadie, watch old episodes of “I Love Lucy,” and make clothes for children, her favorite hobby. Once in a generation, the Effluvia strikes and it affects everyone differently. Missy wakes one morning to find the upside-down house is . . . right-side up? It's not long before Missy has to quarantine the house. Meanwhile she's still fielding calls from worried parents, and Louie can't keep his sticky fingers from taking other people's things! But Missy's magic cure might just do the trick, and even teach some valuable lessons along the way. Rose Howard is obsessed with homonyms. 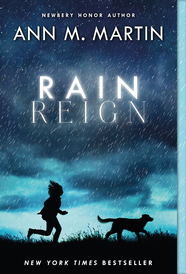 She's thrilled that her own name is a homonym, and she purposely gave her dog Rain a name with two homonyms (Reign, Rein), which, according to Rose's rules of homonyms, is very special. Not everyone understands Rose's obsessions, her rules, and the other things that make her different—not her teachers, not other kids, and not her single father. When a storm hits their rural town, rivers overflow, the roads are flooded, and Rain goes missing. Rose's father shouldn't have let Rain out. Now Rose has to find her dog, even if it means leaving her routines and safe places to search. 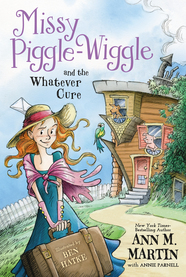 Missy Piggle-Wiggle is finally starting to feel settled in at the upside-down house, and the families in town have come to trust her magical cures for all sorts of childhood (mis)behavior, just like her great-aunt. But right when everything is going so well, a terrible storm blasts through Little Spring Valley, damaging the upside-down house. Now the house is in need of repair (and isn't happy about it one bit), and money is becoming pretty tight for Missy. And, on top of that, the children of Little Spring Valley continue to need Missy's inventive cures, such as the Smarty-Pants Cure, the Whiney-Whiners Cure, and the Won't-Walk-the-Dog Cure. Luckily, Missy knows just what to do! Mrs. Piggle-Wiggle has gone away unexpectedly and left her niece, Missy Piggle-Wiggle, in charge of the Upside-Down House and the beloved animals who live there: Lester the pig, Wag the dog, and Penelope the parrot, among others. 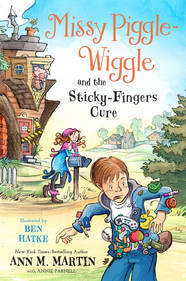 Families in town soon realize that like her great-aunt, Missy Piggle-Wiggle has inventive cures for all sorts of childhood (mis)behavior: The Whatever Cure and the Just-a-Minute Cure, for instance. What is a stressed out parent to do? Why, call Missy Piggle-Wiggle, of course! 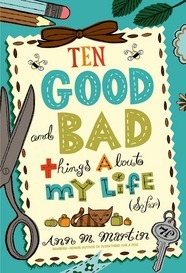 Pearl Littlefield's first assignment in fifth grade is complicated: She has to write an essay about her summer. Where does she begin? Her dad lost his job, she had to go to a different camp—one where her older sister Lexie was a counselor-in-training (ugh! )—and she and her good friend James Brubaker III had a huge fight, which made them both wonder if the other kids were right that girls and boys can't be good friends and which landed one of them in the hospital. Pearl's older sister, Lexie, is in eighth grade and has a boyfriend. Pearl's only boyfriend is the family's crabby cat, Bitey. Lexie is popular. Pearl is not, mostly because of the embarrassing Three Bad Things that happened in school and which no one has forgotten. Everything Pearl does seems to drive Lexie crazy. On top of that, their grandfather is moving into their family's apartment and taking over Pearl's room. How will these sisters share without driving each other crazy? Bone is a stray dog, all alone in the world, looking for a safe place to call home. Charlie is devastated by the death of his older brother, but at least he has his brother's dog to comfort him. All Henry wants is a dog of his own, and even when his best friend moves away, his parents still won't let him have one. 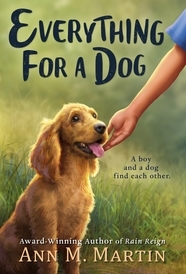 Bone, Charlie, and Henry don't know each other, but their lives are about to connect in a very surprising way. Because dogs, and dog lovers, have a way of finding each other . . .
An Evening with Ann M. Martin Ann talks about her seminal series, The Baby-sitters Club, the writer's life, and her passion for children's literature.